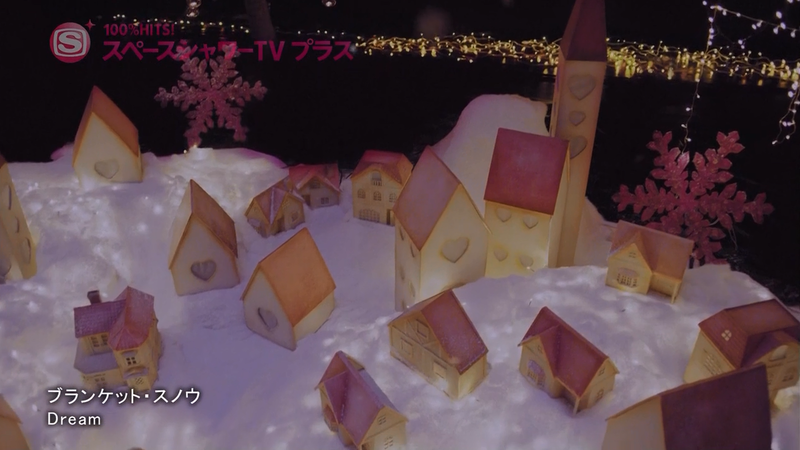 We continue our season of snow and delight with some more Idol videos, all themed around Christmas and the winter time! Whether it includes the cold, the snow or a Christmas Tree and lights, let's celebrate the joys of December, and celebrate the beauty that the winter time can bring. If it's warm, a little sad, or filled with celebration, let's enjoy all that our Idols deliver to us this time of the year. Counting down the days until Christmas, let's continue to open the doors of Advent, and wrap ourselves in a cocoon of warmth and love. Who will deliver a spirited winter song today? I really didn't want to head into a full-on peppy review after yesterday's post, however, I want to keep up the spirit of the winter season and deliver the beauty of Idol videos for this time of the year. I feel pretty inconsiderate doing this right now, but I also know that I must move forward. I also know that no matter what, I will try all I can to keep Jong-hyun alive in my heart. With that said, let's talk about today's video a little bit. I intended to review Dream's Blanket Snow for this small series from the moment I saw it, both for its beauty and because, y'know, snow. Plus, it's a nice video to look at and remember Dream by, who disbanded this past June in order to pursue various solo activities. It's sad to know that we won't ever receive a video as lovely as this one from Dream again, but I'm glad I was able to stumble upon it for this review. I'm even more delighted by the fact that I actually found a full copy of it somewhere on the web, because heck, youtube didn't have it anywhere. That was a rather annoying search, but at least it was around, unlike some videos. Thankfully, the full version proved to be just as pretty and entertaining as the 4 or so minutes worth that youtube had to offer. It's such a cute, winter-fuelled video that is beautiful to watch, and with a sweet, warm atmosphere despite all the snow and winter flurry feels. Of course, it's not as upbeat or adorable as other songs and videos, delivering a more subdued approach that feels a tad more grown-up, even serene at times. Of course, it has its own adorable, sweet moments. It's just not OTT with it, is all. Now it is time to enter this lovely winter wonderland, and entertain ourselves with the warmth and charm of Snow Blanket. Is this all a dream, or the reality of a winter's night? Oh, this is cute! It's like a tiny little town! Is it just me, or does Ami look like she's crying whenever she wears those giant fake lashes? Yo, Shizuka is hella pretty, but her lip gloss looks like it needs to return to the early 2000's. Aww, yiss, stockings! But hey, won't they get wet from all the snow? I mean, hanging them outside is pretty weird, anyways, unless it's for the elves to snuggle into and not Santa? I really hope some little people don't appear with little spears and torches, and ropes to tie Gulliver-Ami down. Though let's be honest, this would be an interesting spin on the classic tale of Gulliver and his many travels. Holy Ssheet, THE SOCKS LIGHT UP! ... Wait, please don't tell me that Aya's a pyro and is lighting them with FYYYYYYYRE? Yeah, I gotta build me one of these. I need lessons on construction, STAT. Ami being all pensieve. Good to see her looking like she wants to do something other than cry, for once. Shizuka is hella gorgeous, though, and she's really eye-catching in this. I love her hair and her eyes. This is so nice, I love how the video dips in and out of the scenery and the members. It gives it so much more texture and depth. And damn, look at that depth of field! A little solar flare never hurt anyone, and damn, Aya! You are a babe, how did I never notice you? That's adorable, I want one. I am in love with those nails. It's little touches like this in the video that make it that much more personal. 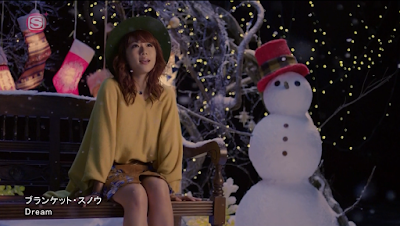 I swear, this is an outfit that Eripon would wear for a single or album cover. It is so MoMusu chic, it's crazy. Erie: "I will leave this group, kekeke." Okay, I love this. That's really cute. It reminds me of fairy tales and movies where the lights turn on when someone believes in something, or it's a certain time of the day in a fairy tale Kingdom. Adorable. Oh damn, I am in love with those costumes, but that dance makes it look like they all have a crick in their neck. Maybe go to a masseuse, girls? I love that, she's keeping Frosty warm! D'aw. Is that a chess board? And that Lantern. I want it. For my bookcase cupboard thing I plan to make. Those dresses flow so nicely, I love everything about them. They kinda remind me of shards of glass. I love that little town they're in. That's hella cute. I just love how warm and sweet this scene is. It gives me snuggly feels. 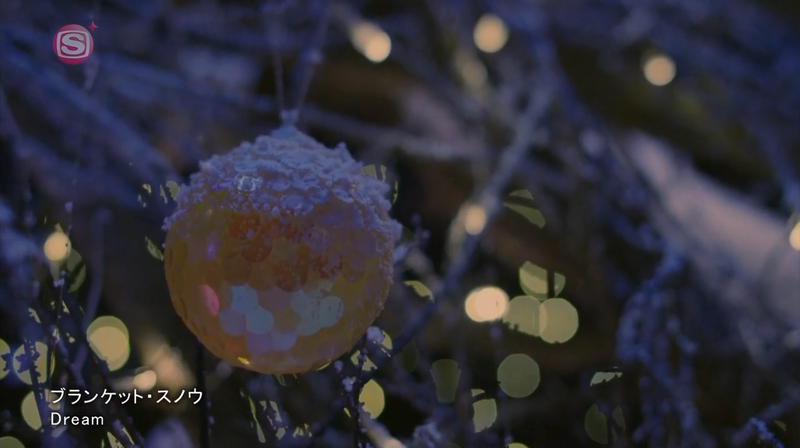 That's a nice shot, and appropriately slowed down for the sake of magic and prettiness. Ami: "Kekekeke, my resignation letter is done~"
Erie has a present for me, yessssssssssssss! And damn, Aya went and got herself a hubby! Frosty, you better treat her right! Again. Hot. Damn. Shizuka. Such a babe. I just love how elegant and flawless this whole scene is. It feels like a ballet, and they glide as beautifully as snow fall. Ami: "AHAHAHAHAHA, BURN! I'll never quit, ahahahaha!" That looks like a cosy little den Shizuka has there. I kinda wanna make one of those, too. Oh, sheet, it turned pink! Are the little people burning the resignation letter? BLANKET! Finally, the song has referenced more than just the blanket of snow. Look at how snuggly and warm they all look! I want to snuggle up and sing, too! Oh, this is just pure cuteness. Aren't they adorable? Guys. This is just wonderful. I love how close and warm and fulfilling these scenes feel. They're delightful, and make me feel pure happiness. This is that one natural friend photo, where that one photo-hog friend (Ami) has to look at the camera and pose because they don't like candid shots. Quick, grab a tissue! Ami might cry again! 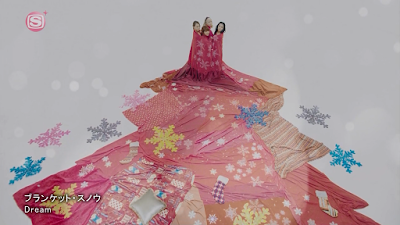 Oh, damn, that's a giant blanket covering the snow there. 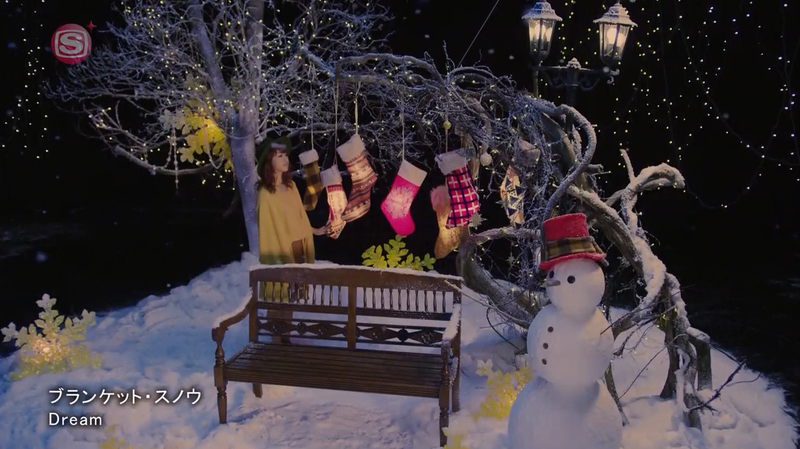 Eripon, I mean Aya. So freakin' gorgeous, right? But Shizuka is all hawtness, isn't she? I would love for her to go solo or debut in HouPri. Blanket Snow, people. Roll credits! Oh, the town is in night mode! That looks even prettier than the typical white mode it was in! Noice. It feels like a true winter night, now, and I see hints of blue in both the interior and the costumes. What a nice touch. I just love how pretty these scenes are, and how both Ami and Erie are cosy in two different ways. I love those outfits, and I love how gorgeous all four of them look. Aya, don't flaunt your boyfriend in front of us all. We might get jealous. Shizuka: "Wish I may, wish I might...~"
This interior, the style of Shizuka's hair, it all makes me think of Princess Jasmine from Aladdin. I feel like Shizuka would fit the role of Jasmine, honestly. I just love how beautiful Ami's scenes are. They really do look like they popped right out of a Fairy Tale. And Queen Erie is just gorgeous. I wanna share a brandy with her, one time. Just gorgeous, and so elegant, too. 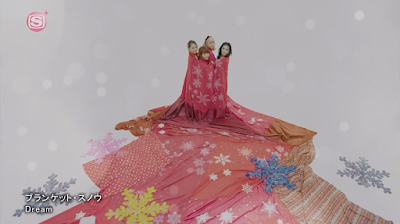 Now, where can I order these dresses? Anyone willing to help? Well, that's a bit of a weird ending, but hey, why not? 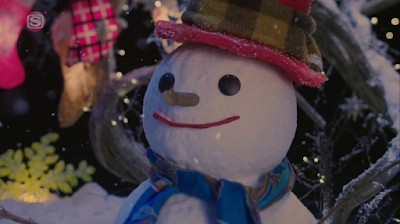 Frosty was a great cameo in this, after all. 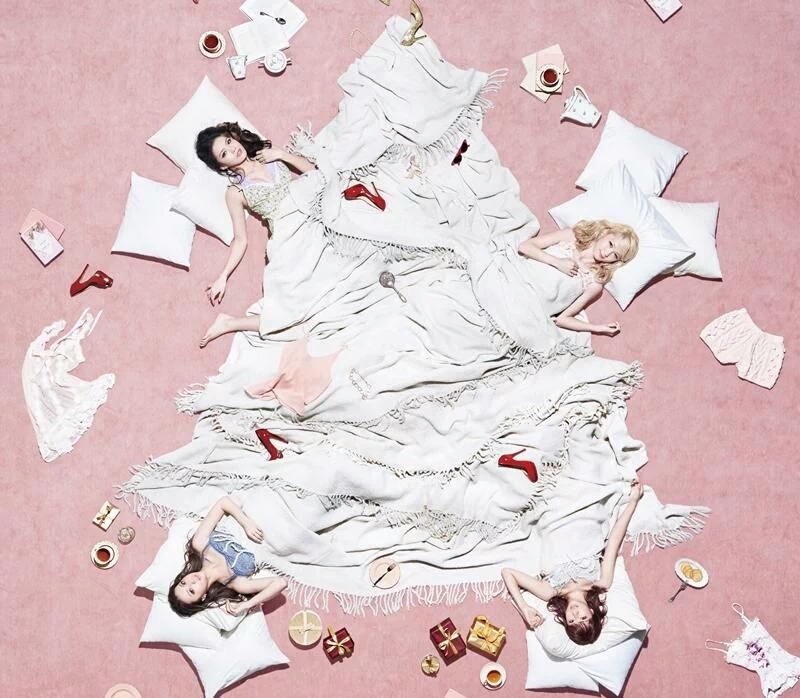 At the start of this review, I wasn't actually aware that Blanket Snow was Dream's last single release before their disbandment this year. I was halfway through my caption commentary when I looked it up, and honestly, I was surprised. As it was released in 2015, I thought for sure they would have more songs out after Blanket Snow. 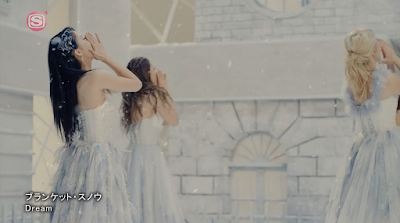 Sad to say, that was not the case, and therefore, I have reviewed both a beautiful winter song and video, as well as the groups last ever single release before their disbandment. I feel all melancholy, now. Knowing this doesn't change my opinion about the video, though, because I like it as much as I did when I first watched it. I mean, it's a really pretty video, one that has some nice imagery, and a whole lot of warmth that appealed to me the first time I laid eyes on it. It truly is gorgeous, delivering both warmth and comfort in its scenes, as well as a dose of that Dream perfection in their choreography. It feels so peaceful and clean, joyful and serene during all the right moments, but gives us an ounce of sharpness through the dance routine. There is a real nice contrast between both the dance and the quieter moments of the video, allowing for some variety in scenes and fitting the slight dance beat that the track for Snow Blanket has. Some of my favourite parts have to be how each individual member is given their own personal space, allowing them to show a certain aspect to each girl that you can easily identify. Erie has a mature yet solitary setting, whilst Ami's feels very serene but approachable. Shizuka's is comfortable and warm, where as Aya's is spirited and open. Each setting for each member is distinct, and represents various aspects of the winter and how we approach it as individuals, I believe, with some being more secure in their own comfort away from others, whilst others are a lot more open about their joy for Christmas and being around people. It's nice to see that kind of approach here, allowing us to visualise the 'types' of people that these girls are, and how they spend their winter nights. Of course, that's my own little theory. There is every chance I could be wrong. Other aspects I enjoy from this video are, of course, the blanket scenes. Those were really cute, touching moments, showing a closeness and warmth that only made this video even more endearing to me as a viewer. It really made me believe the closeness of the members, and reminds me of winter and Christmas spent with friends and those you love most. It's adorable, and it's sweet, and it's made me feel all sentimental and remember my own friends who I would love to spend the winter season with. 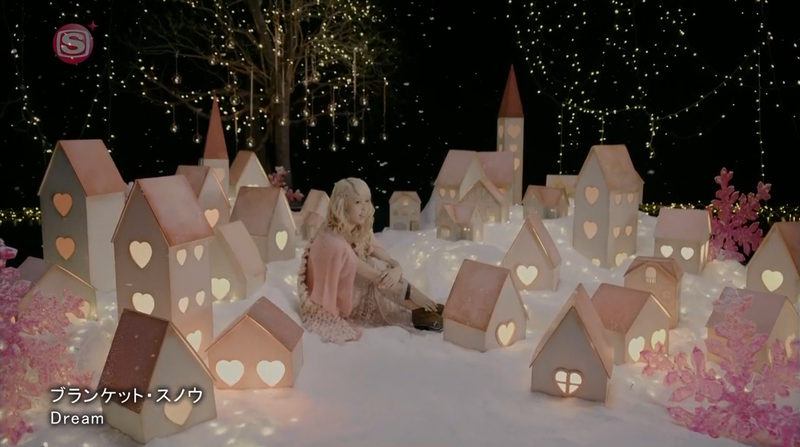 They're really touching scenes, and they make the music video that little bit more enchanting, I think. I love the little additional clips we get of the background props, too, like the baubles and snow hearts, sprinkles and ornaments. Those are fun little snippets, adding some depth and texture to the overall product. It also adds some sparkle and prettiness, and whilst some might find them unnecessary add-ons, I like how they make the video feel a lot more complete. 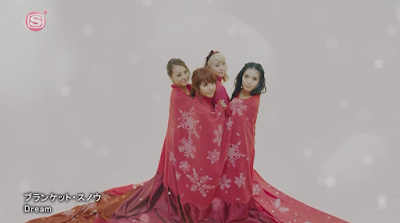 It's giving the world of Blanket Snow its own character, instead of simply relying on the members to fill the void of a blank background. 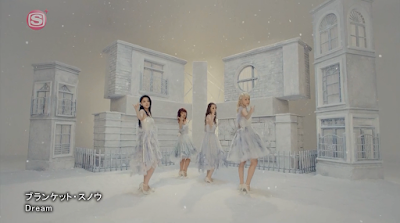 The choreography is also really fun, and I of course love the dresses that Dream wear during the dance segments of the video. Everything flows beautifully, and the grace of the dance and clothing just adds to that magical element this video holds. It's simply gorgeous, and honestly, I wish there were a few more dance clips thrown in here; it's so pretty. 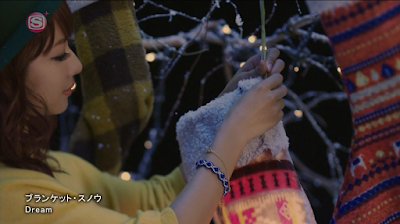 Whenever I watch Blanket Snow, I'm honestly in love with how beautiful and serene it feels. Sure, at times I'm reminded of Mr.Snowman by E-girls, especially when it gives me those magical feels, but I also see it as its own thing. 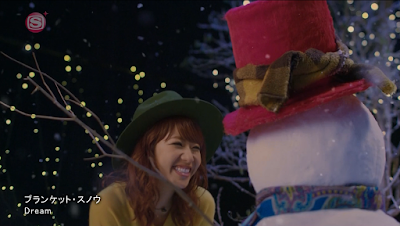 It's definitely a little more mature in its setting, and doesn't rely on Fairy Tales or stories to keep its theme going, but there are little details that just remind of the magic and charm that Mr.Snowman held in its own video. 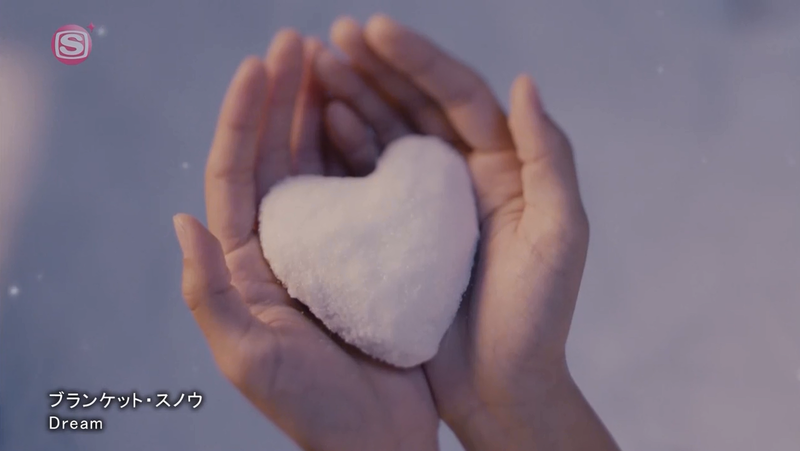 There is a great deal to like about Blanket Snow, and I think that it is a beautiful, well-edited video with some wonderful moments, a lot of warmth, and plenty of charm that will entertain all who watch it. 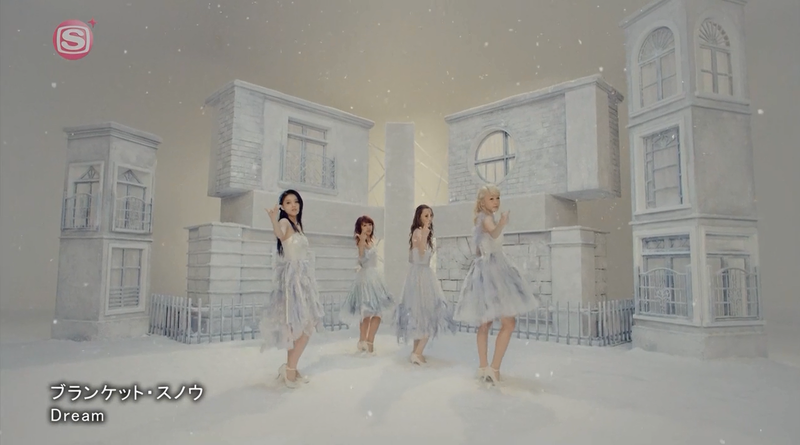 The members look beautiful, I love the gentle, serene feel of the video, and I think that Blanket Snow really shows off the beauty of a winter night in all its gorgeous glory. Embodying so much of what makes winter beautiful and sweet, please give Blanket Snow a chance, and allow yourself to be charmed. This winter's eve, cosy up in your favourite blanket, watch as the snow falls, and listen to the sweet chimes of Dream as you are enveloped by warmth and delight. As the nights grow longer and the days become short, sit by the fire and enjoy your time with the winter's eve. Will you spend it alone, or with someone you cherish? Have a beautiful night, and take care everyone. I hope to see you in our next Advent post.